(left) Science City, the Convention Center of Bengal, (Right) Distinguished guests from left: Prof. (Dr.) Joyanta Kumar Roy, Principal, Narula Institute of Technology and Program Chair ICCIA-2011; Prof. (Dr.) Pranab Kumar Banerjee, Advisor JIS Group & Organizing Chair; Prof. (Dr.) Rabin Nandi, Ex-Professor, Jadavpur University; Mr. Manick Sorcar, CEO/President of Sorcar Engineering/ Manick Sorcar Productions, USA, and the creator/ lecturer of Laser Animation course at Jadavpur University; Prof. (Dr.) A. B. Samaddar, Adviser (Academic), JIS Group; Prof. (Dr.) Ajoy K. Ray, Vice Chancellor, BESU & Conference Chair, ICCIA-2011; Mr. Eric Harpin, Consul General of France; Dr. Swarup Mandal, Chairman, IEEE Communications Society, Calcutta Chapter, and Organizing Chair, ICCIA-2011; Prof. (Dr.) Gautam Chakraborty, Professor and Head of Intelligence Informatics Lab, Iwate Prefecture University, Japan; Prof. (dr.) Asit Guha, Director Academics, JIS Group, Patron ICCIA-2011; and Prof. (Dr.) S. M. Chatterjee, Ex. V.C. BESU. 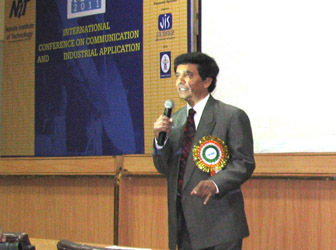 The 1st International conference on Communication and Industrial Applications (ICCIA-2011) organized by Narula Institute of Technology, Kolkata in collaboration with the IEEE, USA ran for three days 26th- 28th December, 2011. The cultural program was held in the evening of December 27, 5:30 pm. 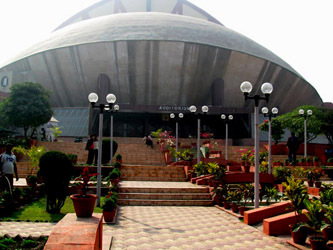 The venue for all of the above was the Science City, Salt Lake, famed as the convention center of Kolkata. Manick Sorcar was invited to be a member of the National Advisory Committee, present a Plenary Speech on “Laser from High Speed Data Communication to the magic of Animation”, and perform his famous laser-live extravaganza during the cultural program. At the inaugural ceremony he was one of the eleven guests, where he was felicitated with the others. 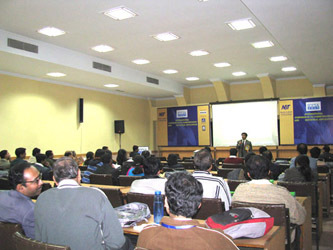 Manick Sorcar delivers a lecture on "Laser from High Speed Data Communication to the magic of Animation"
“The eastern region of our country has tremendous potential for the growth of communication, electronics and wireless technologies along with industry applications. It is felt that there is a strong need to give a new dimension in our efforts to catch up the rapid strides being made in technology..... The vision of the conference is to provide awareness about the recent advances in the Information and Communication Technology through keynote addresses, plenary lectures, tutorials, and pre-reviewed research paper presentations. The conference will also serve as an excellent platform for all the participants to share their views and ideas. Another endeavor of this conference is to collate and present the latest development in Communication and Industry Application Technologies along with realistic assessment of the current status and trends”. The Inaugural Ceremony took place on 26th December, 10 am, at the Mini Auditorium. 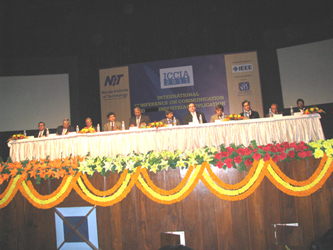 The guests at the head table were Prof. (Dr.) Joyanta Kumar Roy, Principal, Narula Institute of Technology and Program Chair ICCIA-2011, Prof. (Dr.) Pranab K. Banerjee, Advisor, JIS Group and Organizing Chair; Prof. Rabin Nandi, Ex-Professor, Electronics, Jadavpur University; Mr. Manick Sorcar, CEO/President of Sorcar Engineering/ Manick Sorcar Productions, USA, and the creator/ lecturer of Laser Animation course at Jadavpur University; Prof (Dr.) A.B. Samaddar, Director of National Institute of Technology Sikkim and Advisor, JIS Group; Prof. (Dr.) Ajoy Kr. Ray, Vice Chancellor, Bengal Engineering Science University (BESU); Mr. Eric Harpin, Consulate General of France, Dr. Swarup Mandal, Chairman, IEEE Communications Society; Prof. (Dr.) Gautam Chakraborty, Professor and Head of Intelligent Informatics Lab, Iwate Prefecture University, Japan; Prof. (Dr.) Asit Guha, Director (Academic) JIS Group; and Prof ( Dr.) S. M. Chatterjee, former Vice Chancellor, BESCO. The inauguration started with a prayer and lighting the candles by each guest on stage. Each gave a short welcoming speech, who were then felicitated with flowers and a plaque from the Narula Institute of Technology, Agarpala. In his speech Manick mentioned he was humbled to be seated with the other distinguished guests of eminent personality, and he is pleased that he will get an opportunity to demonstrate how laser beam can be manipulated to be used as a paint brush. Plenary Speech took place at the Seminar Halls right after lunch, where Manick gave a lecture on “Laser from High Speed Data Communication to the Magic of Animation” in a packed Seminar Hall #1. On 27th December, Tuesday, the cultural program started at 5:30 pm at the Grand Theatre, Science City. It contained inaugural dances by Satabdi Ballet Troup, recitations by Bratati Bandyopadhyay, Tagore Songs etc. by local artists. The last hour was dedicated to “Magical Moments: A Laser-Live Extravaganza” by Manick Sorcar and his group, which enchanted the audience with five classic items including a 30-minute laser documentary on “Our Republic’s Birth”, which showed the milestones of India’s history starting from 3300 BC Indus Valley Civilization to the Republic Day of India in 1950.